It happens sometimes that we have a Parent and Child entities in Dynamics, and we need to link a child record to a parent record. Which seems to be a simple task unless, of course, we need to do it automatically. That’s exactly when we’ll know that we have an unexpected problem – if we wanted to use a workflow, there would be no out-of-the-box functionality that would allow us to do that. Things can quickly get worse if it turns out we need to apply more complex rules when looking for a parent record. And what if there are duplicates? Arghh..
Every now and then we would have some unusual situation where we would have to put a few Child records to Dynamics, we would know that there are Parent records, and, yet, the relationship would be more complicated. For instance, we might have a few parent accounts with the same name, and we would have to choose the most recent one. Out-of-the-box Dynamics workflow are not offering this kind of lookup functionality, but this can be accomplished using a custom workflow activity. 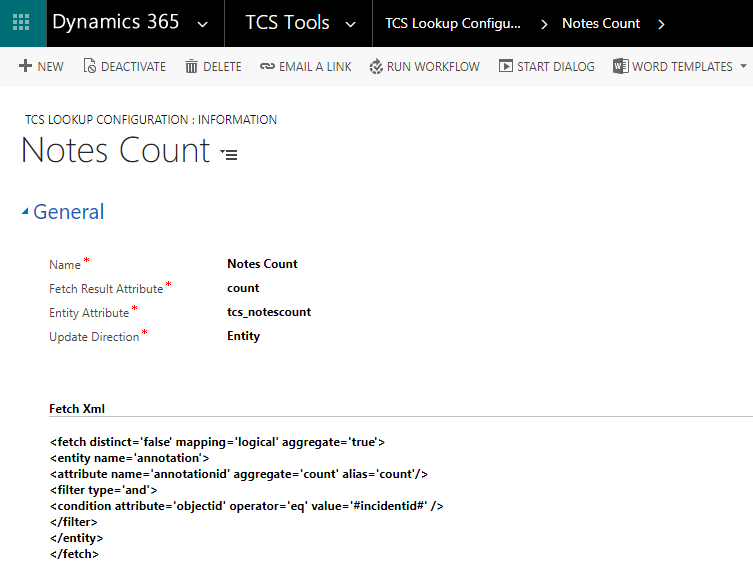 If that’s why you are reading this post, my TCS Tools solution for Dynamics CRM might be of some help. Here is how it works. 1. Import the solution to Dynamics. It is an managed solution, so you will be able to remove it. 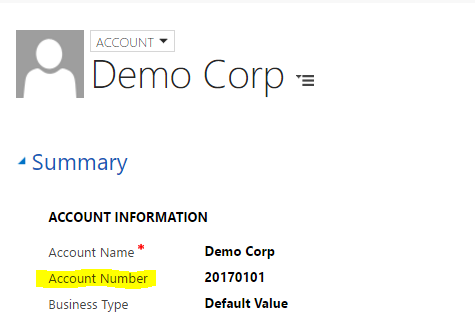 That’s an out-of-the-box “accountnumber” field, although it is not available on the form by default, so I just added it there. The schema name of this field is “tcs_accountnumber”. We’ll need it a bit later. 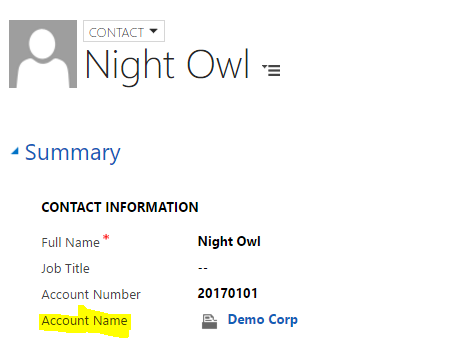 when adding a new contact, we will know account number, but we won’t know account name. What we need is to create a workflow that will correctly populate “Account Name” lookup in this situation. Notice how I put tcs_accountnumber in the filter there – you can put anything, it’s just for convenience(you’ll see in a second). If it finds a tag, it will replace it with the actual value of the attribute. From here, there are only a few steps left. This is a real-tie workflow – it does not have to be, but it’s more convenient when parent account is set right away. It will run when a contact record is created or when Account Number field is modified on the contact. And it won’t do anything (there is a condition in the first line) if Account Number field is empty. That’s it.. Now I’ll save everything and activate the worfklow. And, with that, I’ll just click “Save”. Here we go.. I knew contact’s account number, and that’s what I put into the contact record – that workflow has done all the rest. 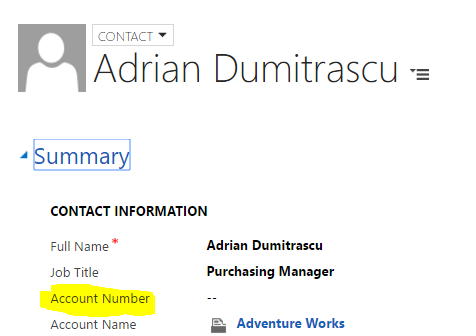 It found the account record and populated “Account Name” field on the newly created contact. From here, I might add more conditions to the Fetch XML if I wanted to define more elaborate rules. I might also use it in combination with the data import jobs or to fine-tune various data migration jobs. All of that without having to write any more code. Mission accomplished! I have a requirement and I’d like to know how i can achieve it via your tool. Here it goes..
First IOT Alert is created > there is no Parent IOT Alert so system creates a Work Order for that Asset. Second IOT Alert is created > Now system should check is there any Work Order of Status=Open + Work Order Asset = ERMS123 + Work Order Incident Type = App Hang. If all the 3 conditions are met, then it should get the WO’s related IOT Alert and set that Alert as the parent to the Second IOT Alert. If no record found it will not set any IOT Alert as parent to the second. Your solution would be a great help. When You setup quick search view including Account Number field in account entity, and when you go to different entity and write account number of any account, CRM automatically will find this account and put it in Lookup. Why you did this development I didn’t understand. The blog post shows you how to use this feature, not necessarily what to use it for. Have a look at what Karuna was trying to do above. That’s a good real-life scenario that requires more complex conditions and workflow automation. Hi Alex, First of all – amazing blog/resources – this Lookup is exactly what I’ve wanted for ages but haven’t worked out how to code for myself – your a legend! However, I imported your TCS Tools solution today and in the workflow builder I’m not seeing the “Lookup Setter” as an option at all – I have a screen grab but can’t post it here. I tried “Attribute Setter” – is that the same, or is it not working because I’m doing something wrong? I also noticed that the “Lookup Configurations” Entity is now called “TCS Lookup Configurations and has a new field called “Update Direction”, which I’ve tried both set to “Entity” and “Fetch Result”, but neither seems to work. I’m guessing you’ve just updated and not had time to update the blog post – I’m sure you’re a busy person! Alex – these tools are brilliant – really appreciate your work here! Thanks.. and yes, you’ve figured it out:) Used to be a look-up setter, but you can really use it to set other attributes types, too, so got renamed along the way. This looks to be just what I need, but I have a question. I have a record called “Telepsych”. It is not a direct child of an “Account”, but they are connected in a way. I have a lookup on the “Telepsych” Record back to the account called “Located Within”. When I set the Account association to the “Located Within” field on the Telepsych, I need this to update the Account “Telepsych Lookup” lookup field with the value for the Telepsych record I just added the account on. Users who work with the Telepsych records do not visit Account records often, so I need to update the Account value automatically somehow. Right now, it errors because it cannot seem to find the right entity to update. It automatically looks at the wrong one. That might be my issue, and part might be because the schema name of that field is the same on mutiple different entities. Basically, I want to use this to update a lookup on the Account record when I update a lookup on the Telepsych record. Any idea what I can do, or do you need more information? So you can probably set up a workflow to run on update of that first lookup (on the Telepsych entity) – just add an update step to update the account and set Telepsych lookup on that account record. I re-looked into this with fresh eyes and found my mistake. I was looking at it the wrong way. I ended up getting what I needed. I over-thought it. Hi – thanks for this – really useful. Is there an easy way to get this to create a new record in the target entity if it does not find a match? 2. Have it wait a minute. 3. If the lookup field is blank, create a new record. it’s about time someone got up with these goodies, way to go! But, we won’t be upgrading to 8.2 for some time. Could you pretty please send me the 8.1 version of TCS Tools? Thanks for responding this quick. I managed to download (ofcourse), but import fails because of the absense of msdyn_/Images/AppModule_Default_Icon.png, so I can’t really test it. Any chance you’d provide/share that one webresource? nah, got that part working. Import was succesful. Haven’t got it working yet, but I’ll keep trying. So far, thank you very much, Alex! I’ve encountered a rather weird thing. I got your fantastic solution up and running. Now ‘all of the sudden’ (yeah, I know, there’s no such thing) it stopped working. I recreated a very straight forward situation, but it still doesn’t do a thing at all. I’ve tested the XML by copy/paste in XML Builder, works as a charm. Fields exist, but the target attribute just doesn’t get set. Do you have any idea what I can do to debug this any further? Anyone of you encountered. Not able to find the “Lookup configurations” in the dropdown on step 2? Sorry, I don’t really get it. Could you help me? I have an salesorder entity and custom salesorderdetail. I need to calculate total price for all records in salesorderdetail. The field “order_total_price” is placed at the salesorder entity. Is it possible to do using TCS Tools? I did everything exactly as you described but I have issues with building FetchXML. I have doubts about “condition attribute” and “value”. Could you please help me to build the right Fetch XML? It seems like it’s the final step to rich the goal. The idea is that you need to select all salesorderdetail records for that salesorder and calculate the sum. Notice how “count” is an aggregate function on the screenshot above, and it’s also an alias for the attribute (can give it a different alias name, but that’s what goes to the fetch result attribute). In your case, it’ll be “sum”. Literally you just need to take the fetchxml there and replace annotation (note) with salesorderdetails, incidentid with #salesorderid#(or whatever the lookup field name is in your case), count with sum.. 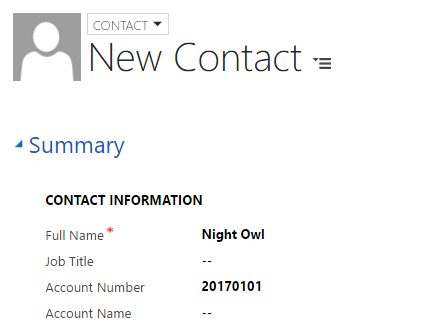 I need to automatically populate the Required field on the appointment form with the Primary Contact from the Account used in the Regarding field. Google guided me to your blog and I found it quite useful, thank you. However. 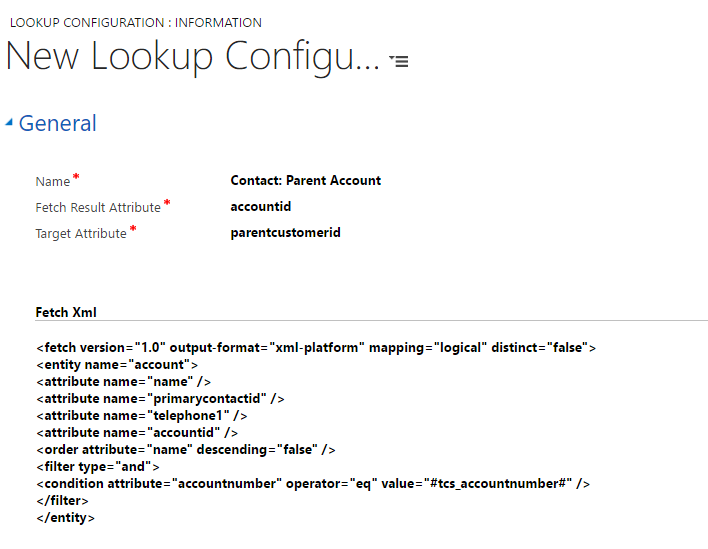 I need to better understand the workings of your lookup configuration tool. For my issue what would I for the Fetch Result Attribute? Also, I don’t have the “Target Attribute” field just a “Entity Attribute” one, what do I fill in there? Target Attribute is an older name for the “Entity Attribute”, so, basically, it’s the same. 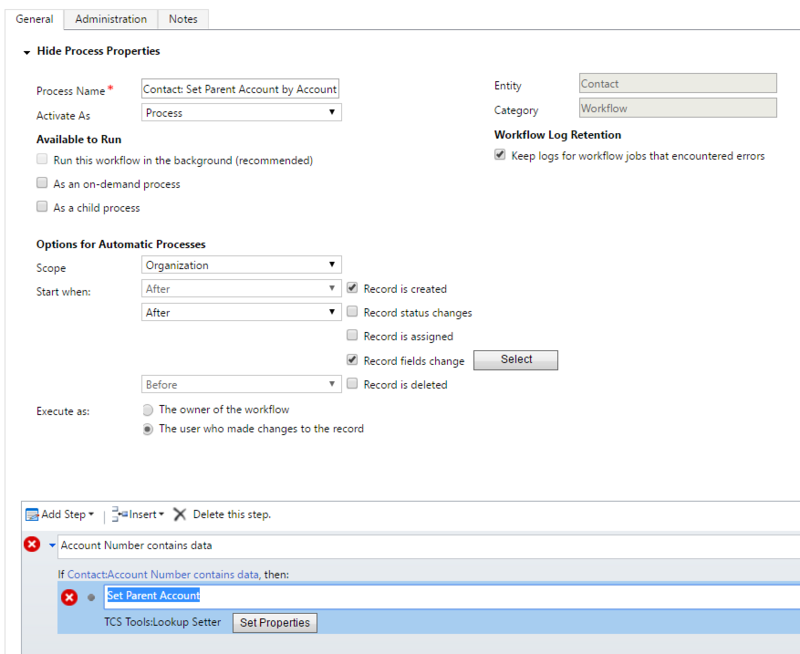 I am wondering if you really need to use TCS Tools, though.. You should be able to create a regular workflow to set “required” from “regarding”.. in the “set properties” window of the update step, select Regarding(Account) in the “look for” dropdown, then select “Contact” field. Unless I misunderstood what you are trying to achieve. I use this to match Company Name to existing Accounts, and 99% of the time it works great. The only time it seems to fail is when there are special characters such as & in the search string. Hi Alex – yep – we are v9! I am facing “*Invalid type for entity id value*” issue when on record update of Attribute Setter. I have verified that fetchXML is working fine and I doubt that the error is thrown on updating the record or setting the guid value to Entity Attribute. Unhandled Exception: Microsoft.Xrm.Sdk.InvalidPluginExecutionException: Invalid type for entity id value. Sorry for bothering you. After I read the samples for Attribute Setter, I understood how Update Direction works and my workflow is successfully working. Thank you and really appreciate your great tool.